Take one peek inside this beautiful, gulf front five-bedroom, four-and-a-half bathroom house suited for a large family or multiple families. 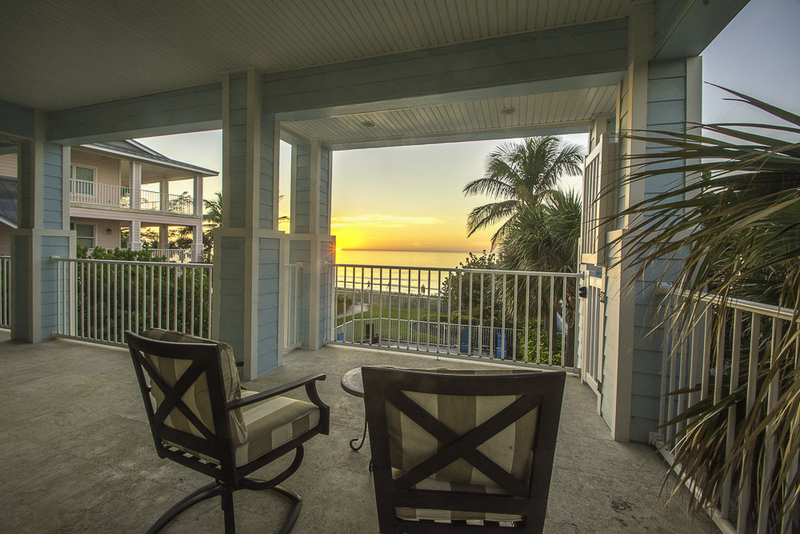 This beachfront home is an exclusive property with a private heated pool and excellent gulf views from the oversized balconies. These expansive balconies provide the perfect space for gathering and entertaining with loved ones. From the pristine landscaping and outdoor area to the comfortable and sophisticated accommodations inside, you're sure to enjoy every inch of this house during your vacation. Our Exclusive Aqua Escape boasts of distinct style and unique design. Windows throughout the three floors provide an abundance of natural light and endless water views. On the first floor of the home, you'll find the first room which features a wet bar, mini fridge, pull out sofa, Large LCD TV and stereo with CD and DVD. This room has a full bathroom. Sliding doors from this room open out to the private pool and your own barbeque area. Heading upstairs to the second floor of the home, you will find a spacious floor plan featuring the living room, kitchen and dining area. The second floor is very open and spacious and allows you and your guests to freely move from one area to the next while enjoying each other's company. Sit back and enjoy the company of your friends and family in the living area. Relax while you take in a movie on the flat-screen television, or move outside to the balcony to enjoy a drink and share a meal with friends. Prepare dinner on the outdoor grill or head inside to create a delicious meal in the spacious, fully-furnished kitchen. This masterpiece kitchen is every chef's dream with an abundance of open space. Dine indoors around the dining table or outside on the balconies. The large wood dining table seats twelve guests and can be found just off the kitchen area. Second floor also features a half bathroom. Third floor features 4 bedrooms and a large balcony. The large spacious master bedroom is tastefully decorated in shades of tan and green with a mixture of light and dark-wood furniture. Relax in this peaceful bedroom, which includes a king bed, private bathroom, television and DVD player. The master bedroom has a large balcony that can be accessed through the master bedroom and the second bedroom. Located just down the hall from the master bedroom are three additional guest bedrooms Ðperfect for accommodating friends and family members. The second bedroom boasts a Queen Size bed and a private bathroom. This bedroom is complete with windows that overlook the beach and the private pool. Third bedroom also provides beach views and it boasts queen size bunk beds and shares a bathroom with the fourth bedroom. The fourth bedroom offers a set of bunk beds. The first floor has an additional room, which has a pull out sofa. Easily accommodating up to 12 guests. Some of the extras include wifi, laundry area, full kitchen, bbq grill, surround system, two car garage and best of all gulf views from all floors. This three-story, Key West-style house is perfect for relaxing with lots of friends and family. You will be surrounded by the very best amenities and comforts that our beautiful home has to offer. If you're looking to escape everyday life in style and sophistication, look no further than in our Exclusive Aqua Escape. Whether you're lounging inside or enjoying the great Florida outdoors, your vacation will be wonderfully enriched by this beautiful beachfront paradise. Located in a beachfront gated community in Indian Rocks Beach, you will find that the home is quiet and offers a sense of privacy. Aqua Escape is a wonderful vacation getaway and property! The white sandy beach with aqua water, provided a serene and relaxing atmosphere! My favorite, was the stunning views of the beach from the dining room table, family room, and porches. This house is very spacious, beautifully designed and decorated. The kitchen itself felt like a retreat with the large island and dining room table! The pool and beach are just steps away and so inviting! I highly recommend this beach house for families and friends alike, and would definitely return! The house was beautiful, and the view of the ocean was breathtaking. we spent so much time in the pool because it was so relaxing. There was so much room to have up to 14 people sleep comfortably. The kitchen was huge and had everything we would need to make meals as everyone talked and laughed at the counter. Hands down the best rental I have ever stayed in! Excellent property!! We had a group of 10 and there were absolutely NO COMPLAINTS. From the beautiful interior to the private pool and beach access, we could not have enjoyed it more. Thank you for providing such a beautiful and peaceful location. This house is absolutely wonderful & awesome. It truly is just steps from the beach which we loved. No long hike to retrieve something you forgot or to get lunch. Plenty of beach chairs & other items for either the beach or pool were available. We also loved that the yard is now fully fenced in which just made us fell a little more secured. The kitchen is fully stocked with kitchen utensils that was great as we cooked all but 2 nights. We loved the large electric skillet and used it all the time. The house was very clean upon our arrival. The location is perfect as it is in a more private area so the beach is not crowded, but it also is not far from Clearwater for entertainment, restuarants, etc. Best of both worlds. I also love the fact that we could rent from Friday to Friday as we left Friday to head to St. Pete Beach for a family wedding. There was a problem with the front gate, but we called our house manager right away and it was taken care of. Just a few items to know. 1. If your vehicle is larger than a mini van, you may not be able to get it all the way into the garage. We just left the garage open. 2. The jacuzzi was not working, but that was not a problem for us. We had 10 adults & 1 two year old in our group. I highly recommend this house for you vacation. My family is now spoiled and it will be hard to top this. If we every stay in the area we will rent this home again. Beachtimerentals.com was also great to work with. I actually recommend them to some new home owners in the area. To the family that shared this home with us. Thank you very much. I've stayed at Aqua Escape multiple times and I can't say enough great things about my time there. The location is perfect; literally steps from the sand, it feels like you have a private beach to yourself. The views from the large balcony are the perfect way to relax at the end of the day as the sun sets. When looking to explore the area, there are great restaurants in walking distance and even more that are just minutes away by car. The home has all the amenities you could ask for: pool, laundry, beach chairs/towels and a 2 car garage. Brought some family and friends here for my wives 40th. House is awesome! Great pool, beach access, eateries and bars in walking distance! Staff from beach time rentals were great and easy to work with! I will book with them again!! FABULOUS! We really enjoyed staying in the house. It is right on the beach, has a private pool, and lots of nice outdoor and indoor living spaces. very nice! The property and home were great! Location was wonderful. We had a great time! We had very minor problems: no blankets, lights quit working, pool heater quit working, but every problem was resolved! The only thing we didn't like about our stay at this house was having to leave. It was great! Perfect place to relax. We had 11 people and there was enough room to get lost in the house and be alone or there were great gathering areas on the patios and pool. the kitchen table was big enough for all of us to sit together. I wish the check out was a little later. it was difficult to get everyone packed and out by 10 am. I would stay there again.